There are many Psychological Obstacles For Traders. No greed control, no emotions control – trade whenever you feel like trading, itching to trade just to trade and have fun, etc. All of these are dangerous to your trading account. You should trade only when an opportunity comes not wherever you feel like or you think so. When I asked him did you hedge? He said what is hedge? This is where the problem is – one you trade naked (naked trading is when you trade without hedge), second you trade because you think so a put or a call will increase in value, third there is no risk-management. For how long will this go? Then why blame the stock markets when you yourself are destroying your wealth through speculative trading? Trying to make too much money in a small time will NEVER WORK. But you can make small profits consistently. Its better to make small profits more often than making huge and then losing it all. 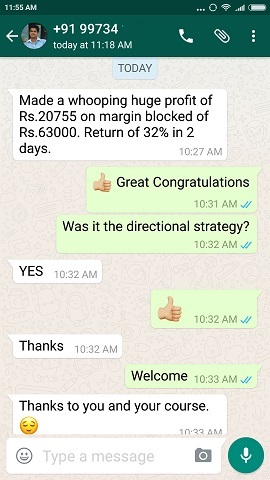 If you are one of them who is losing consistently trading options you can do my conservative option course where you will learn how to make small profits consistently every month. Your job is making more money – give your time to your job – and give only 20 minutes a day to stock markets yet create wealth from stock markets. New traders and even experienced traders believe that there is some magic pill which if they can crack they can become extremely rich trading derivatives in matter of months. This is simply not true. Yes if done well your CAGR (Compounded Annual Growth Rate) on trading money will be good like 20-30% per year, but it can never get near 100% which most traders especially new traders think. 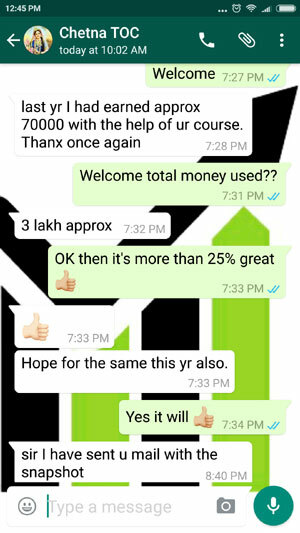 A lot of people do not do my course for this reason alone – they keep the phone down as soon as I say you can make approx 2-3% a month. This is too less they say and keep the phone. They keep trying to achieve that 10% per month – some per trade, and lose it all. Then realizing that even 1% a month is a good return. Then they call me back after realizing the facts. No doubt why 99% of traders lose money and 80% of investors lose money. But those 1% traders make more than those 20% of investors. It needs real patience and practice to reach that 1% mark of traders who make money, but if done well its possible. For that you have to know your obstacles – come over them, do some research and get some knowledge. As soon as a trader gets into a trade the first thing they look is for instant profit. This is not fixed deposit. Hey even fixed deposit has a time limit. If you take your money out before the fixed time you will not be paid the promised percentage. Then how come you think that as soon as you get into a trade you will profit? After this two things may happen. Either a small profit or a small loss. When the trader sees a profit he/she immediately books it. But when they see a loss, they sit tight in the hope that the stock will reverse and bless them with money. Stock does not reverse and losses exceeds. When it goes beyond imagination the trader takes a atop loss only to see the stock reversing as soon as they took a stop loss. INTRADAY DAY TRADING IS ALSO A PERFECT EXAMPLE OF INSTANT GRATIFICATION. No doubt why intraday trading is very popular. 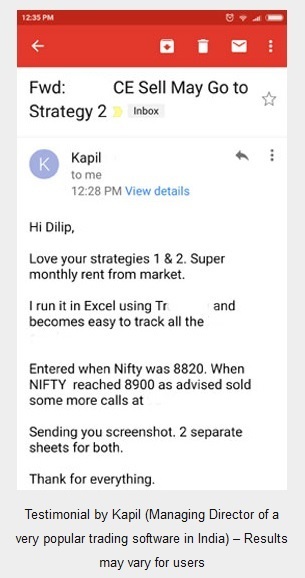 There is nothing wrong in Intraday trading if you are making profit in 8 out of 10 trades. But how many make profits in intraday trading? When it comes to buying a piece of cloth we have a lot of patience. We jump from one mall to another, one shop to another to buy a Rs.500/- shirt/saree, but when it comes to bet Rs.50,000 in trading we do not think twice – it just takes a second to invest. Patience is the main difference between winning and losing traders. Jesse Lauriston Livermore said it perfectly: “Money in the stock market is made by sitting (waiting for the profits to come), not trading (every second)”. When we lose money we go for revenge trading. Stock markets has no friends or enemies, it does not know you. 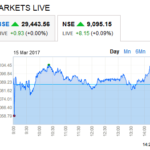 So why to show ego to stock markets? When you took a wrong trade it is you who should take the blame, not the stock markets. Try to master your ego and study your wrong trades – do not show ego/anger to stock markets and increase the lot size by 10 times. You are likely to lose more. No strategy has a 100% win rate. So when you are wrong take it humbly. But you must make sure to hedge your position so that when wrong the loss should not pinch you. If you have not hedged your position overnight, one loss can wipe out weeks and even months of gains. 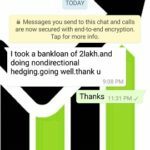 Hedging positional traders is very important. If you cannot keep your losses small, I can tell you with guarantee that you will never be able to become a good trader. You will lose all money in your account. If you have a lot of ego, it is advisable to either hedge your trades or keep a stop loss in the system not in your mind. New traders have a habit of looking at the Mark to market (MTM), and the trade every second. If you have taken a positional trade then there is no need to keep looking at the trade every second. Fluctuation is part of stock markets. If you have set your target and stop loss – come into action only when they get triggered. One good trade and the trader pats himself at the back thinking that he/she is a good trader. Exactly opposite if they see a red day. One or two trades do not define you as a trader. You monthly performance defines it and your yearly ledger confirms it. This is a big Psychological Obstacle. If you just got a profit you will jump into conclusion and take another trade based on the previous trade. Similarly if you had a bad trade you will never copy it. A new trade is a new trade. All trades are completely independent of each other. Do not try to base one trade to another trade. Your findings and research are more important than the trade itself. If you have done lots of paper trading and seen success then just because the first real trade failed does not makes your research trash. If you are trading in fear you will never make money. If you are trading in fear it means you are gambling not trading. Hedging your trades will take the fear out because you will know beforehand that it will restrict losses, and you will be able to trade successfully. Fear will cause you to take profits too early, but sit back on losses. Hedge will ensure you neither take out profits early nor see huge losses ever. FOMO (fear of missing out) is also a big Psychological Obstacle. If a trader decided to buy a future of a stock but out of fear did not buy and later sees that the stock actually jumped 10-20%, he/she will surly take the next trade because of FOMO (fear of missing out) – but this time they see a loss. To take fear out learn to hedge, respect your stop loss and do not take huge risk initially until you start seeing profits. 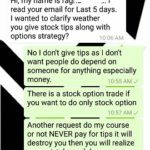 If you are a future and option trader you must learn hedging to restrict huge losses overnight. You can do my conservative option course and learn properly hedged strategies to make consistent monthly income. 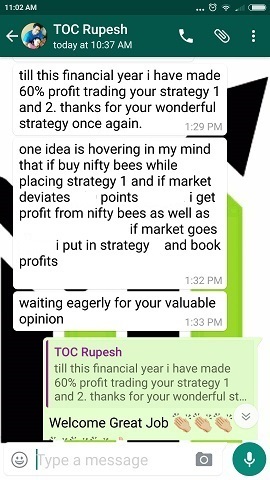 These strategies can be traded in Nifty, Bank Nifty or Stocks. 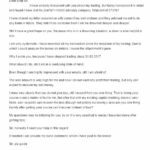 You can see testimonials here and enroll for the course here.